Natural Infrastructure: A Climate-Smart Solution explores the role that green or natural infrastructure can play in addressing climate action imperatives. The paper begins with a discussion of what natural infrastructure is; explores how natural infrastructure addresses the three climate imperatives; describes the multipurpose public benefits of natural infrastructure; and explains how to scale up natural infrastructure by taking a comprehensive approach and building the business case for investing in natural infrastructure. 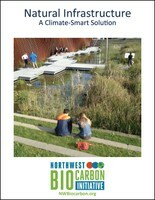 In the supplement, we include examples of natural infrastructure strategies throughout the Northwest that demonstrate how natural infrastructure works to address the three climate imperatives, while delivering a range of co-benefits. Download the report here.